Seven piece funk machine The Jig releases its third album Proximo Disco in june 2016. Like the previous ones, Proximo Disco is packed with heavy funk with a rock ’n’ roll attitude combined with soul, afro, jazz and more. 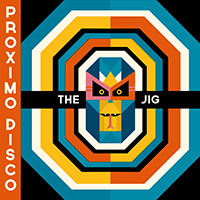 On Proximo Disco The Jig sounds more diverse and catchier than ever, thanks to a.o. cutting edge guitar sounds, hysterical Moog vibes and cunning collective songwriting. Denying the bands principles, The Jig works for the first time with a vocalist on this album: ruthless Mr. Ruben Seyferth, who sounds like a collision between Prince and Steven Tyler (Aerosmith), can be heard on three tracks (and live on more). The album is mastered by sonic hero Darius van Helfteren, the eye catching artwork is by renowned British illustrator Ben Newman. Proximo Disco is available on vinyl, cd and online. With its new album Aargh!, Amsterdam-based group The Jig establishes its reputation as an original heart-warming and uncut funk collective. The Jig is one of few genuine funk bands in Europe. It is an instrumental groove machine with a rock & roll-attitude, known for its powerful and exhilarating live shows. Inspired by heroes such as Bootsy Collins, Lettuce, James Brown, Average White Band and The Meters, The Jig creates its own original sound: vintage and up-to-date at the same time. Soul, Afro, Jazz and Rock & Roll are kept close. 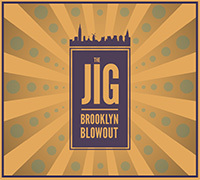 Two years after the successful album Brooklyn Blowout, which was recorded in New York, The Jig retreated to its home ground Rock Supplies in Amsterdam's Baarsjes neighbourhood to record fresh and tasty new material in a semi-live setting. The eleven tracks on Aargh! breathe warmth, spontaneity, a hint of craziness and are highly dancable. Some of the bands musical friends dropped by: trombonist and singer Joseph Bowie (Defunkt), tenor-tough-guy Boris van der Lek and Holland's foremost jazz musician: alto saxophonist Benjamin Herman. The album was mixed in the internationally renowned Studio 150 by Joeri Saal and mastered by Zlaya Hadzich. 2011 - Recorded in Grand Street Recording Studios, Brooklyn NYC. In the spring of 2011 a new instrumental funksound hit everybody's ears. Amsterdam's seven-piece outfit The Jig released its first album: Brooklyn Blowout, and the vinyl 7" Grindbag. Recorded in New York, the album breathes the cosmopolitan and yet warmly human atmosphere of Brooklyn, combined with true Amsterdam swagger. Elements of afrobeat, soul, rhythm 'n' blues and jazz are squeezed into fresh funk with a rock 'n' roll attitude. The bandmembers state: The Jig is not 'funky', The Jig is FUNK! The album is available on spotify, itunes and other digital media. You can also order it by clicking here.